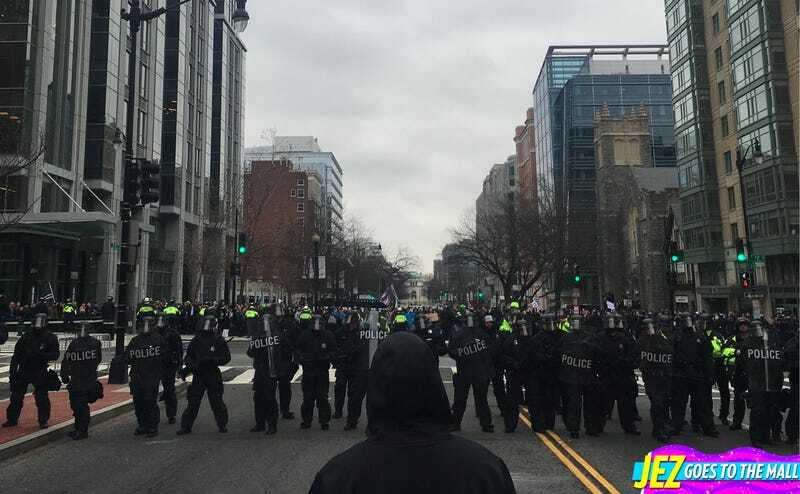 WASHINGTON, D.C.—Early on Friday afternoon, after Donald Trump was sworn in as president and before he made the walk from Capitol Hill to the White House, dissidents marched through the streets near McPherson Square. A young man, dressed all in black, ran up to the main body of protesters, marching from McPherson to Freedom Plaza. “Cops kettled a bunch of our friends,” he shouted. “Come on!” About a hundred people peeled off to gather on a small hill. Across the street, behind several lines of police in riot gear, about a dozen activists were being arrested. In a statement, the Metropolitan Police Department said they had been charged with rioting. The crowd grew: More and more demonstrators gathered at two sides of the blocked-off traffic intersection. Police pushed someone who’d stepped into the street back up onto the sidewalk. Tight-lipped cops adjusted their grips on their night sticks, resting canisters of pepper spray on their hips. Anarchists, anti-fascists, socialists, and disaffected Democrats linked arms and chanted their support for their comrades. “Show them how we love,” an organizer said into a bullhorn. “Don’t give them a reason to act out.” A light drizzle came and went. The stalemate broke after about an hour. Shouting led to pushing; pushing led to shoving; and then—pepper spray. Pink smoke poured into the sky. A woman ran from the police line, a child clutched in her arms. The first flash-bangs cracked and boomed in the shiny glass canyon. Volunteer medics treated a demonstrator, tears streaming down her face. “I know you don’t want to move,” one told her. “But we have to go.” The police advanced. At least one officer fired a paintball gun into the crowd. The tide ebbed and flowed: police would force the protesters back, and then the protesters would move forward again, checking over their shoulders for cops trying to box them in. A photographer knelt to take a picture of a protester posing in front of the advancing police line; a flash-bang exploded under his feet. Some demonstrators lobbed pieces of bricks and cement at the police, which they deflected with their plexiglass shields, and responded to with spray and grenades. As this debate continued, anarchists dragged garbage cans and newspaper racks and fences into the middle of the street. The windows of a limousine were smashed. Elsewhere, President Trump ate lobster, steak, and chocolate soufflé with Senator Mitch McConnell. At least 217 protesters were arrested.